A customer who has a shop ‘Puce and Co’ in St Barts in the french Caribbean sent us these pictures of a deckchair she has recovered with The Stripes Company vintage deckchair canvas. Here is the finished chair in my garden and in my shop window. 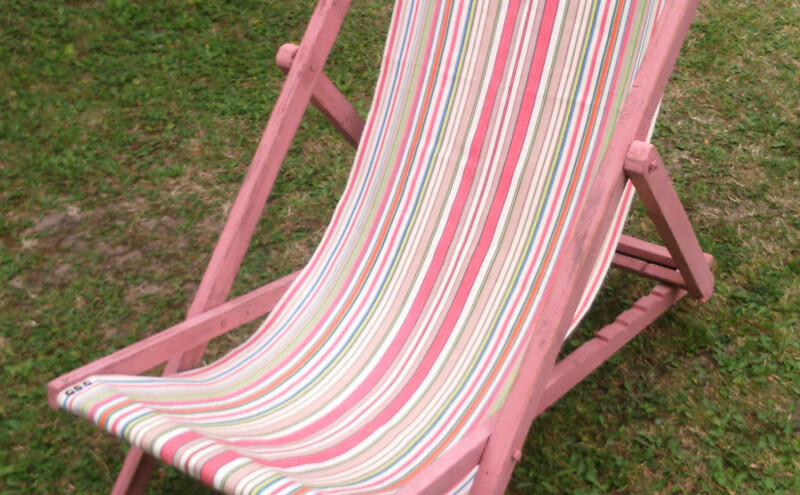 The frame has been painted in Annie Sloan Scandinavian Pink Paint which perfectly matches the fabric – vintage deckchair canvas – Slamball stripe! Judy used Mahjong deckchair canvas fabric 45cm wide, also available in 150cm wide interior stripe fabric suitable for upholstery, curtains, blinds and soft furnishings. Thank you very much for my wonderful roman blinds I loved them so much I have another order for you! I have just received my beach towels and I wanted to let you know that I am extremely impressed by both the product and the excellent, efficient service that you and your colleagues have provided. Thank you – if only all companies were as good! I have just received the most delicious (and prompt) parcel from you….oh these stripes cushions have surpassed all my expectations. They are an absolute joy to the eye, so exciting, so cheery, I feel happy! And the sweets…what can I say…can I buy a bag full from you?? Matching striped sweets…ultimate summer bliss. The two ‘Skittles’ stripe roman blinds which you kindly sent to us are now fitted and look superb in the kitchen of our new house. They complement wonderfully the ‘Skittles’ curtains which are in the adjoining family room. We are delighted with them, and thank you for all your help. I am writing to confirm great satisfaction of the blinds recently purchased and received. Thank you for the high standard of workmanship and perfection. Thank you. I think this is the fastest delivery I have ever received, ordered pm yesterday and here in rural Cumbria this morning. Well done! The gloves look great too. We Are Thrilled With The Canvas! Thanks again for your assistance. We are thrilled with the chair. I had a good sleep in it this afternoon!